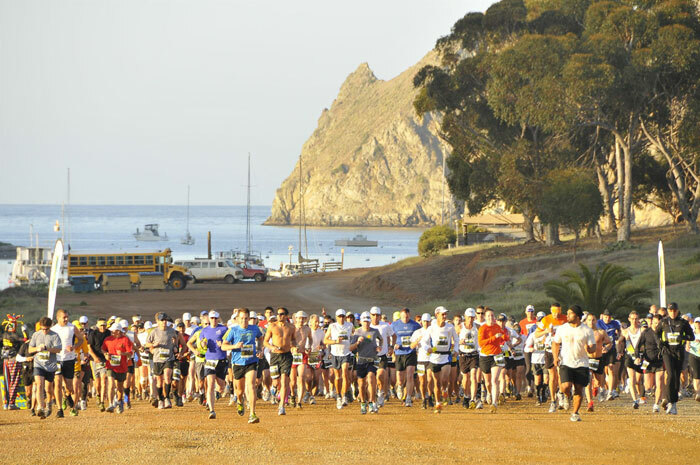 AVALON — It’s time to lace up those running shoes and run with hundreds of racing aficionados in the annual Catalina Island Conservancy Marathon, March 9. The event will raise funds for the conservancy’s efforts toward island conservation and preservation. In the main event, Participants can jog, sprint, walk or run along a trail through 26 miles of the island’s rugged terrain and scenic vistas. 10K, 5K, Marathon Walkers and Kids’ Run events are also offered. Awards will be presented to the top three male and female finishers in each age division — and to the top three male and female finishers overall. After the race, those 21 and older can get a beverage at the event’s Beer Garden, hosted by the Avalon Lions Club. Runners staying the night in Two Harbors are invited to “carb up” before the big run at the Harbor Reef’s Restaurant pasta buffet. Diners will enjoy a garden salad, garlic bread and “all you can eat” spaghetti and meatballs. A fountain drink, along with a choice of chocolate or strawberry cake for dessert, is included in the meal. The price is $14 for adults; $7 for children. Marathon runners will walk away with a “Finisher” shirt, a medal and a 2013 Finisher Year Bar. Participants in the 10K and 5K events will receive a short-sleeved shirt. Participants in the Kids’ Run will receive a Kids’ Finisher Medal. Registration fees are $145 for the marathon, $40 for the 10K, $40 for the 5K and $10 for the Kids’ Run. Start times are 6:30 a.m. in Two Harbors for the Marathon Walkers event; 7 a.m. in Two Harbors for the main marathon; 8:15 a.m. in Avalon for the 5K event; 8:20 a.m. in Avalon for the 10K event; and 9:30 a.m. in Avalon for the Kids’ Run. To sign up, visit runcatalina.com.